Enthusiasm. Challenge and Obstinacy in the MACBA Collection is a travelling exhibition from the Visual Arts Programme of the Artistic Dissemination Office (ODA) of Barcelona Provincial Council, organised in conjunction with the Museu d’Art Contemporani de Barcelona (MACBA) and in collaboration with the municipalities hosting it. Enthusiasm. Challenge and Obstinacy in the MACBA Collection is a project that addresses contemporaneity from an optimistic, persistent and passionate perspective. A direct concept that, rather than displaying work thematically or chronologically, stands as a specific whole; that is to say, a particular way of understanding artistic practice that vindicates the emotional intensity of the artwork. In general terms, enthusiasm is understood as a subjective process of exaltation of the spirit, in which passion and fervour act as an emotional trigger of what we want to achieve, be it discreet, ambitious, intimate or public. Through a plural analysis of the concept, the project reviews the MACBA collection with the aim of staging and contrasting a series of behaviours and attitudes that are prone to this excitement. A firm and obstinate position that rejects naïve or simply cheerful attitudes in favour of confidence, resistance and furore at different levels. The exhibition proposes an exercise in the activation of works, in which diverse causes and challenges are interwoven, giving rise to a selection of unique challenges that, within the field of contemporary art, move between individual obsession and aesthetic, social and political commitment. Following these premises, Enthusiasm. 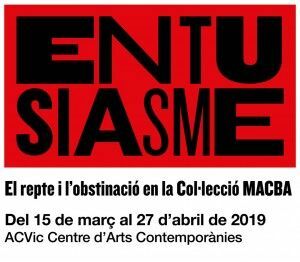 Challenge and Obstinacy in the MACBA Collection puts forward five possible approaches based on the enthusiastic act: the cosmogonic construction, the creative power of daily life, the performative charge of the body, social activism and the crisis of the very notion of art. In other words, the determination of artists such as Zush, Anne-Lise Coste and Younès Rahmoun to build a world of their own through experiences, fantasies and beliefs; the repetition of simple and everyday gestures by Esther Ferrer, Ignasi Aballí, Dieter Roth, Richard Hamilton and Tere Recarens; the performativity of Vito Acconci and Àngels Ribé; the non- conformist actions of Maja Bajevic, Emanuel Licha, Mireia Sallarès, Cildo Meireles and Gordon Matta-Clark; and, finally, the critique of the art system by artists such as Marcel Broodthaers and Peter Friedl, who suggest a narrative sequence in which Enthusiasm denotes a strong ideological position before the artistic fact: that, in the end, conceives art as an act of faith capable of achieving its aim, whether it is changing the world or simply questioning oneself. Enthusiasm builds on the conceptual legacy of two projects based on this concept and which were developed in Barcelona in the mid-2000s. On the one hand, the Faith and Enthusiasm (2004) project by the artist Antonio Ortega: a processual exhibition focused on the notion of success and organised at Espai 13 at the Fundació Joan Miró with the aim of raising funds to build a waxwork figure of Yola Berrocal, the best example of Enthusiasm, according to the artist. On the other hand, the exhibition Enthusiasm presented at the Fundació Antoni Tàpies in 2005: an archive of films linked to the Polish amateur film movement between 1950 and 1980 compiled by the artists Neil Cummings and Marysia Lewandowska. Both projects incorporated a liberating impulse arising from passion. And it is here, in the challenge that is more visceral than rational, more passionate than strategic, that the intensity of this survey of the MACBA collection lies. Despite having very different objectives, and doing so through disparate forms of presentation, all the artists in the exhibition share the same gesture: to express themselves forcefully. Under the effect of contagion and complicity, the three concepts behind the exhibition— Enthusiasm, challenge and obstinacy— are also applied to the agents and structures that intervene in the project: in the curatorial stance, in the configuration of the MACBA collection, in the desire of the Visual Arts Programme of Barcelona Provincial Council to disseminate and, best of all, in the interrelation with the individuals and groups that visit the exhibition.